If you’ve been reading my blog for a while, you probably know that I’ve moved a lot. Moving can be an exciting adventure, but it’s also a very stressful process…house hunting, pricing and scheduling movers, organizing and packing, saying goodbye to people (the worst), and unpacking/setting everything up again in a new place. Then there’s the financial aspect of moving. No matter how well I think our things will “fit” in a new place, there are always purchases that need to be made, and they add up quickly. When we moved into our current rental house about two-and-a-half years ago, I needed several rugs, two new sofas (ours got damaged during the move), and some decorative items. Many of the things that had worked in our last home just didn’t work at all in the new one. It felt totally overwhelming, not to mention expensive. Unfortunately, I did not know about CORT Clearance Center when we first moved in, or it would have saved me a lot of stress AND a lot of money. 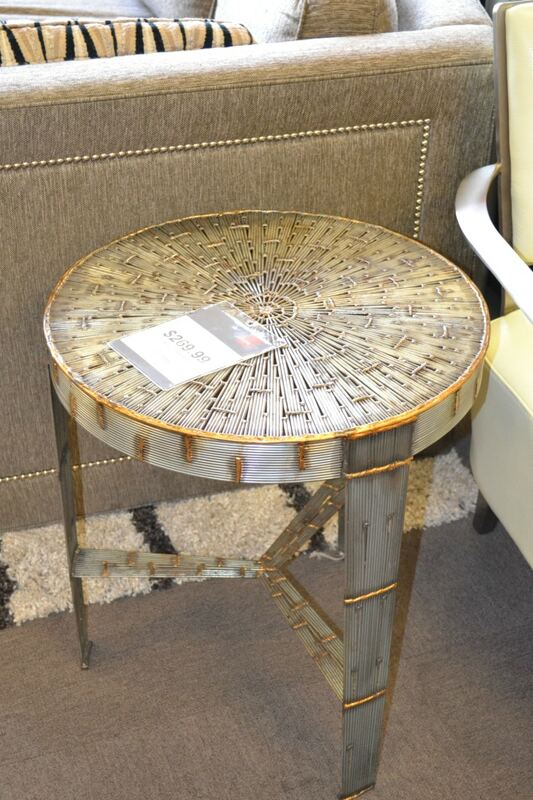 This past week, I had the opportunity to check out a local CORT Clearance Furniture Center to see what they had to offer, and I was totally impressed. 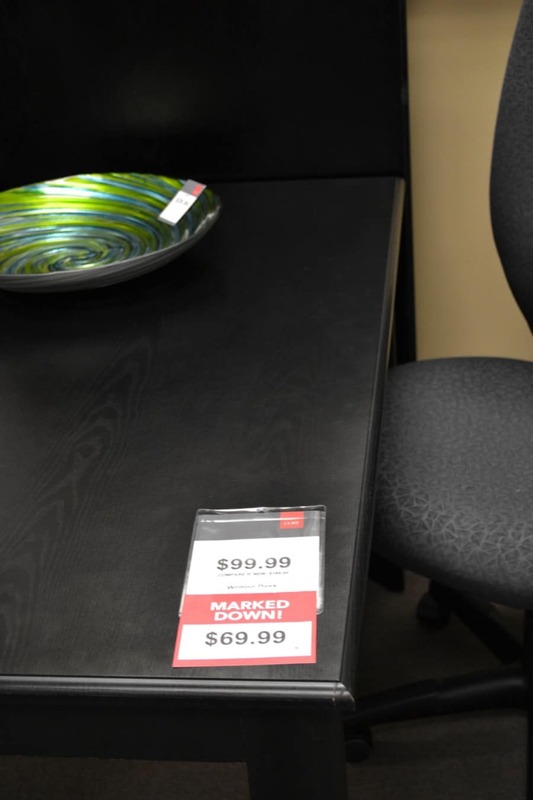 If you’ve never been to a CORT Clearance Center, they sell affordable, premium quality discount furniture at up to 70% off MSRP. 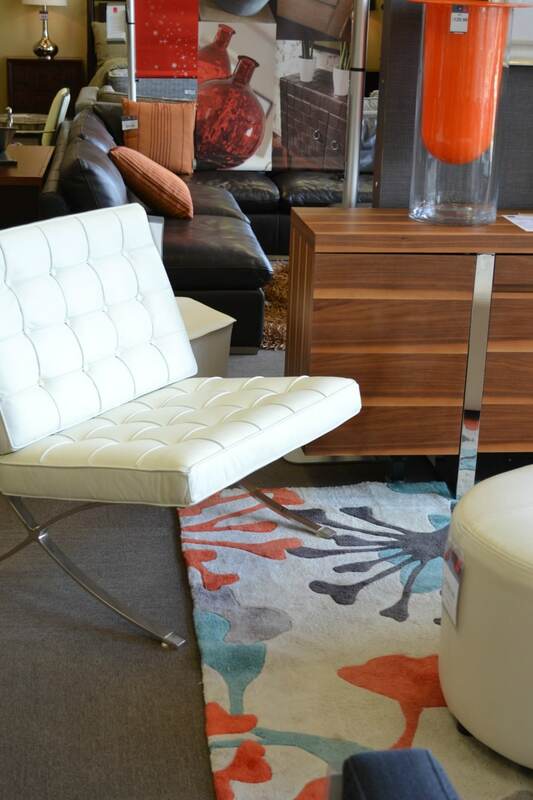 You’ll find a wide range of residential furniture (living room, bedroom, dining room) available, as well as office furniture and lots of decorative accessories and accent pieces. 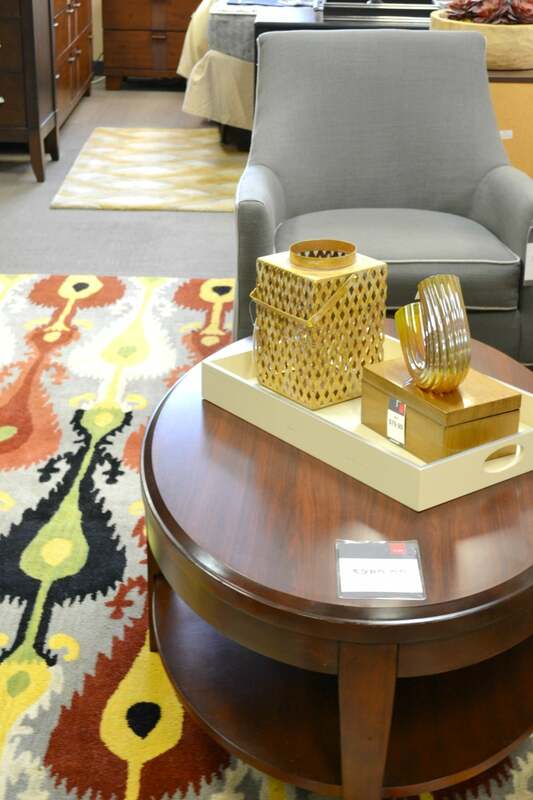 The first thing I noticed when I walked into the CORT showroom was how the furniture and accent pieces were set up to look like cohesive, well-decorated rooms versus just individual items. You don’t have to buy the “rooms” as a set, but if you’re somebody who doesn’t feel confident putting a room together, they do the work for you, down to rugs, throw pillows, decorative accents and even wall art. If you choose to buy an “instant home to go” package, you can score a great discount. 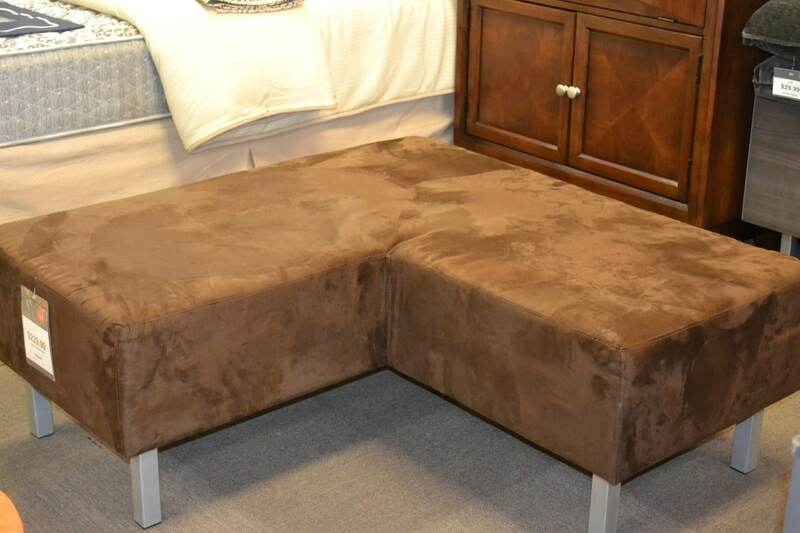 It’s perfect for somebody moving into a new home or apartment, or anybody who just wants to refresh a room or two in their current home. 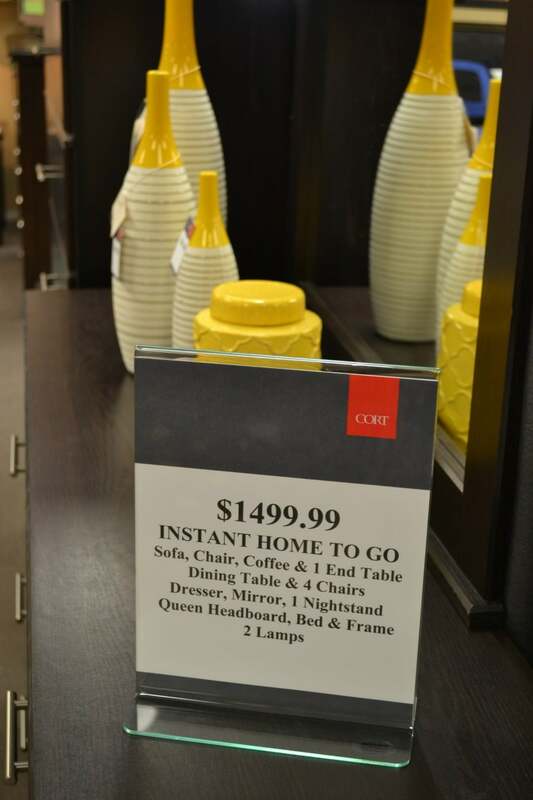 The furniture at CORT’s is affordable, but it’s not cheaply made. 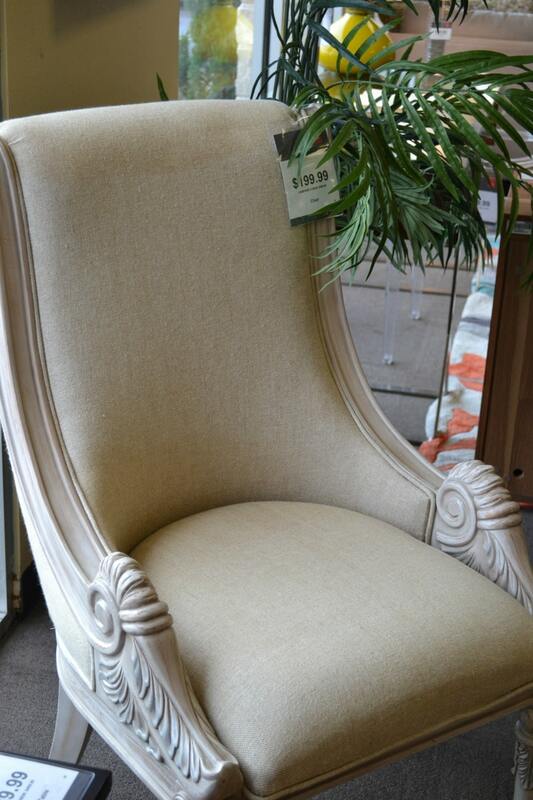 They use durable fabric, robust stitching, real wood, and other quality construction items. Each item is also CORT Certified, which means that if any defects are discovered within 90 days, the piece will be replaced or repaired at no cost. You can tell that the items there are going to stand the test of time, which is important to me — especially because my husband is a basketball coach and it’s not uncommon to have VERY tall people in our home. I do not want to be cringing every time somebody sits down, praying that the chair won’t fall apart. 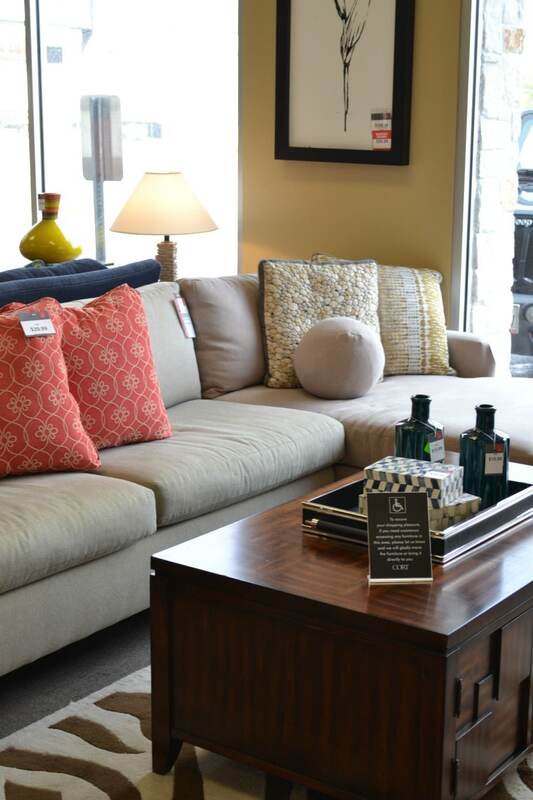 In addition to offering a wide variety of price points, CORT also has a diverse selection of styles. I even discovered some unique pieces of furniture that I wouldn’t not have known about if I hadn’t gone in to take a look. 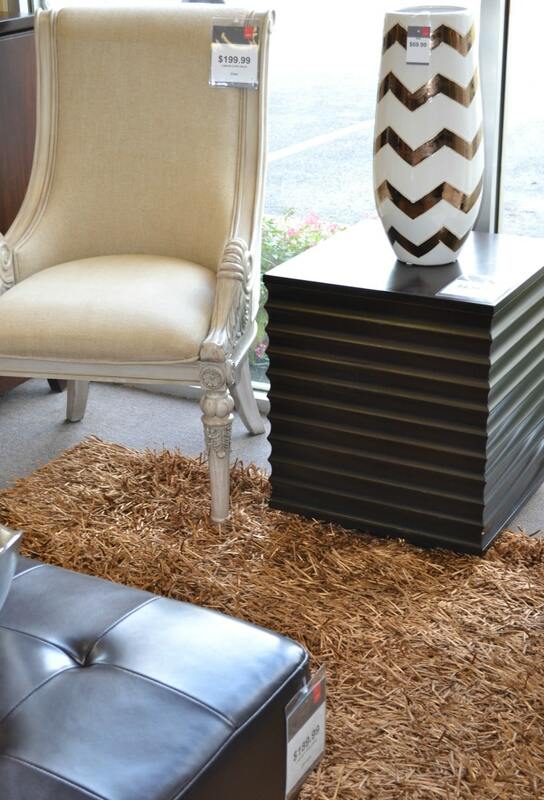 This corner ottoman would be perfect for extra seating in a small living room, or even a bedroom. 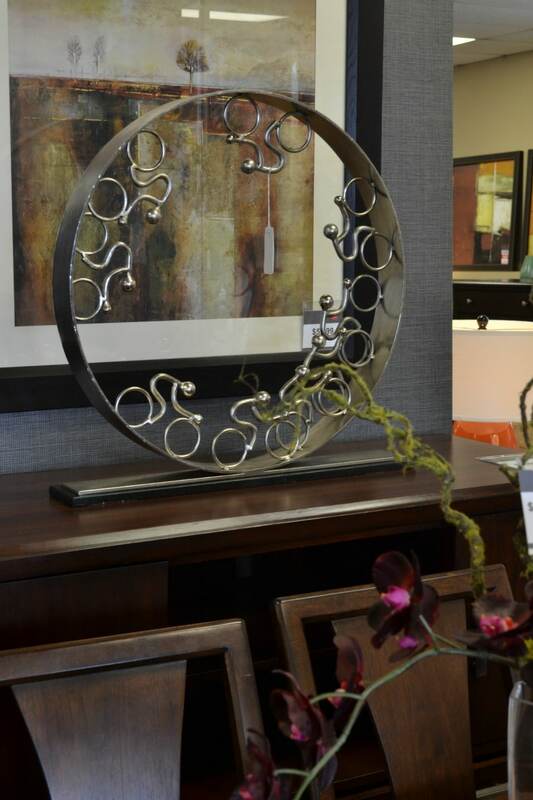 The inventory at CORT Clearance Centers is always changing, so you never know what you’re going to find. I saw so many different types of decor while I was there, and got lots of decorating inspiration. CORT Clearance Center will be the first place I go when it’s time to move again, or whenever I’m in need of something new for my home. Follow this link to find your local clearance center.